Does global water stress matter for U.S. national security, and if so, how? That’s a major focus of the next CNA Military Advisory Board report, says Julia McQuaid of the CNA Corporation in this week’s podcast. She talks about the preliminary findings of the report and how the national security community views water. Understandably, the primary focus of much of the U.S. national security apparatus has been terrorist organizations like ISIS and Al Qaeda. “Most of these groups and these threats are operating in areas where there is deep instability and/or are hot conflict zones,” says McQuaid. “Incidentally many of them are also experiencing the conditions of water stress.” The correlation has made water a natural point of interest. But while there is an implicit sense that water stress and conflict are connected, there is little comprehensive research that defines and articulates the link. Speculative work predicting “water wars” that do not come to pass has led many in the military to question, “when the rubber hits the road, how do these conditions lead to conflict?” says McQuaid, who has worked closely with Pentagon personnel in her time at CNA. She explained that the conflicts predominant in the Middle East and North Africa – insurgencies, civil wars, and terrorism – are always the result of multiple factors. “Many involve governments and non-state actors competing or vying for the support and acquiescence of population, and/or they’re trying to control physical territory. And in most cases, the entities opposing the groups are trying to overthrow the government and replace it ultimately. That’s the end goal.” No single factor can be isolated as the source of conflict in these cases, including water. “We know it’s not a straight line,” she says. “What water stress conditions can do and tend to do is to act as an additional stressor or multiplier on top of preexisting challenges that in many cases are also not being addressed.” She points to Northern Nigeria and Libya as regions where longstanding issues of corruption, lack of economic opportunity, and migration have combined with water problems in dangerous ways. Early warning systems and analytical tools could help to a certain degree, says McQuaid. The difficult question for the military though is what does a warfighting organization do about water stress? 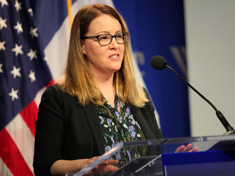 Julia McQuaid spoke at the Wilson Center on March 1, 2017.